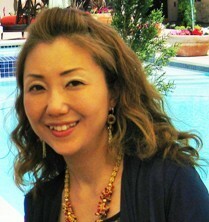 I am Maiko Kage Felton, a bead jewelry designer and instructor. When I was in the United States in 2001, I happened upon some beautiful bead magazines. Impressed by the beauty of the pieces profiled in the magazines I found beadwork very inspirational and I set out to master various beading techniques, and soon embarked on my journey as a jewelry designer. Now I live in Irvine, California. My jewelry pieces tend to explore the interplay between symmetry and nature. I prefer to let my creativity flow freely; this allows the piece to seemingly define itself during its creation. I love sharing my jewelry interpretations of nature and life. Inspiring and exchanging ideas with others has always been one of my main objectives as a bead artist/designer. So many people, including family, friends, fellow artists and students have given me so much throughout the years, and I would like to respond in kind. Beadwork is a very personal endeavor. It can also be a very solitary experience with very few opportunities for feedback, and punctuated with times of doubt and frustration. Sure, displaying one's work in a public forum can be frightening. But the sharing of one's work and ideas is necessary to give life and energy to that work. I've published two beading books in Japan and conducted bead workshops in Japan and the United States, my tutorials appear in Bead & Button Magazine. I like participating in bead contests and have been a finalist in the Bead Dreams contests in 2005, 2006, 2007, 2008 and 2011. My beadworks have also won in the Bead Arts Award in 2005 and 2006. After graduating college, worked for several companies. Gave a piano lessons as a part time job on weekends. Visit a bead shop in O.C., America Find “ Bead & Button “ at a book store in Santa Monica. Begin to have interest in bead jewelry. ( I was introduced to the off-loom technique at this time) Learn new techniques by myself. Open an off-loom beadwork lesson.
" Beaded Cabochon Necklace with Ruby, and Jingle Ring " which were featured in the Japanese magazine " Beads Friend Vol.5 "
" Ice Crystals " was featured in the Lapidary Journal (Oct, 2005) and the Step by Step Beads. (Sept-Oct, 2005) in the American Magazine. Bead & Button, The 2006 Bead Dreams Competition, Seed Bead Wearable Finalist, "Forget Me Not"
Bead & Button Aug 2006 Issue 74　"Peyote Stitch Chain Links"
Lapidary Journal & Step by Step Beads, 2006 Bead Arts Awards Beaded Necklace, the second prize " FireWorks"
Bead & Button, The 2007 Bead Dreams Competition, Seed Bead Wearable Finalist "Rhapsody in Blue" and "White Gerbera Wedding"
Bead & Button The 2008 Bead Dreams Competition, Seed Bead Wearable Finalist "Cleopatra"
Move to Irvine, CA USA.